Announcing the first release of PolyFrame Beta 01. PolyFrame is a geometry-based, structural form finding plug-in for Rhinoceros. It is based on the principle of the equilibrium of polyhedral frames known as 3D graphic statics. 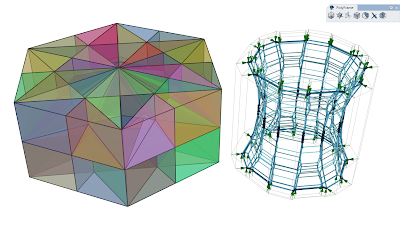 PolyFrame is a computational framework that allows the construction and manipulation of reciprocal polyhedrons for structural form finding. With this tool, a designer can simultaneously design and control the flow of forces in a structural form and drive the optimal structural solutions constrained to certain boundary conditions or specific geometric properties such as edge lengths and surface areas. PolyFrame is based on a polyhedral construction and manipulation environment called PolyFramework. Download it from the Polyhedral Structures Lab website.